Egusi soup is popular in Western Africa. The soup is thickened with ground melon, gourd, or squash seeds. Look for the seeds in African or International grocery stores. Pumpkin seeds, also known as pepitas, can be substituted and are available in Latin American grocery stores. Yield is 8 servings. 1. Put the goat meat in a medium pot. 2. Rinse the dried fish and add it to the pot. 3. Add 1 onion, salt to taste and 2 maggi cubes. 4. Add 3 cups water and bring to a boil on high heat. Reduce heat and simmer for 30 min. 5. Meanwhile, put the chile peppers and the remaining onion in a blender and puree. 6. Scrape the onion pepper mixture into a bowl and set aside. 7. Put the shrimp, crayfish and melon seed in a clean blender and blend until a powder forms. 8. Put it in a bowl and set aside. 9. Squeeze the excess liquid from the spinach and set aside. 10. After 30 minutes, check the meat. 11. If it is still tough, add more water to the pot so that cooking liquid covers the meat. 12. Continue to cook until the goat is fork tender, add the onion pepper mixture and cook 15 minutes. 13. Reduce heat to medium and add the melon seed mixture. 14. Cook 30 minutes longer and add the spinach, the oils and the 2 remaining maggi cubes. 15. Cover it and cook for another 15 minutes. 1. Bring 1 3/4 cups water to a boil on high heat. 2. Turn the heat to medium and stir in the pounded yam flour. 3. Keep stirring until it is smooth and soft. If it is really thick, add some hot water. It will have a similar texture to polenta. 4. 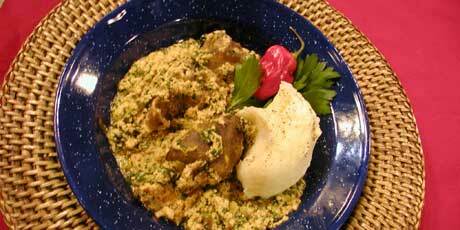 Serve the pounded yam on plates and serve with bowls of egusi soup. 5. Dip the pounded yam into the egusi soup. Recipe courtesy of Esther Adeolu, Chef, B's Place.